To blog or not to blog? I get this question from our eCommerce clients all the time. Many of them have tried blogging, but are discouraged because “it hasn’t worked for them.” They publish several articles per week or per month and give up when they don’t see the sales coming in right way. One of the many reasons why they don’t see results is because of low website traffic. Unfortunately, if a website has low traffic, blogging won’t increase that traffic overnight. To have articles or blogs rank organically, it takes months and requires the execution of several search engine optimization practices. However, many of those clients do have website traffic but still have no eCommerce conversions … so, what’s going on in those cases? I’ve found that most experience poor results because they don’t optimize their articles for conversions and don’t implement other efforts to stay in front of their readers. As you’ll see in the tips below, the key is to think of content as the initial point of contact, or an introduction. Once you grab the attention of your readers, you can then nurture them until they convert into paying customers. No matter how much content you produce, if it doesn’t speak to your ideal target customer, you’ll be wasting your time engaging the wrong type of readers. Thus, take time to develop a content calendar that speaks to your audience and addresses their specific interests or concerns. Think of your content as a helping guide for your ideal customers in different stages of the buying cycle: awareness, consideration and purchase. For instance, let’s say you have an eCommerce store that sells boating shoes and you’re trying to get new customers that are in two different stages of the buying process: awareness and consideration. As you can imagine, the content produced for ideal customers in the awareness stage will be totally different from the content generated for ideal customers in the consideration stage. The ones in the awareness stage are not familiar with your brand, so they’ll need a “softer” introduction to your products. For example, you can create a fashion guide about how to pair boating shoes with clothing. In that guide, you can introduce your shoe brand to users who were just looking to learn fashion tips online and were not specifically searching for your shoe brand. In such articles, you’ll want to emphasize things like your unique value proposition, company story, and/or testimonials. In other words, convince users that your store is better than your competitor’s. This tip is essential to make other key efforts work successfully. The idea is to capture your reader’s information while they are reading your blogs, so you can build your email list, retarget those contacts on other platforms, and email them to convert them into paying customers. They may seem like a small addition to your website, but I’ve seen a great increase in email subscriptions thanks to this little tool. And the more targeted you can make it to the user, the better. You can customize them with many online tools or apps that will allow you to take care of the whole design and customization process. Sumo is one of those tools, and it will allow you to get super targeted with your pop-ups. For instance, you can use this tool to customize your pop-up copy based on specific URLs. So, you would be able to show different messages according to the website your reader is on. Let’s say your visitor is reading about how to choose the perfect engagement ring. Then you can show a message that says something like: “Looking for the perfect ring? We’ll help you decide. Add your email below.” This message would be very different from the one another visitor can get reading about necklaces. Targeted messages like those will increase your conversion rate. Not all your blog visitors will be ready to make a purchase at a moment they read one of your articles, and that’s okay. As long as you remind them about your brand and products, they will come back to your store if they are interested. The low conversions arise when you don’t stay in front of those blog readers, and they end up forgetting about your brand in the long run. In other words, what you need to do is remarketing. There are many platforms that can be used for remarketing, but, in this tip, we’ll talk about social media. The first option, using an email list, will help you retarget the users that subscribed to your newsletters while reading one of your blogs. This segment will be “warmer” than the “all visitors” segment because they decided to engage with your brand. 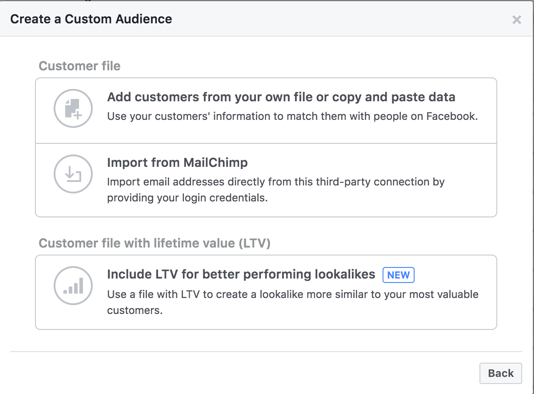 To retarget an email list, you’ll have to create a custom audience on Facebook. Just go to “Audiences” located in the drop-down menu of your Ads Manager, and select the first option: Customer File. Then you’ll have the option to import your contacts directly from Mailchimp or upload a CSV file. Choose whichever option works best for you. 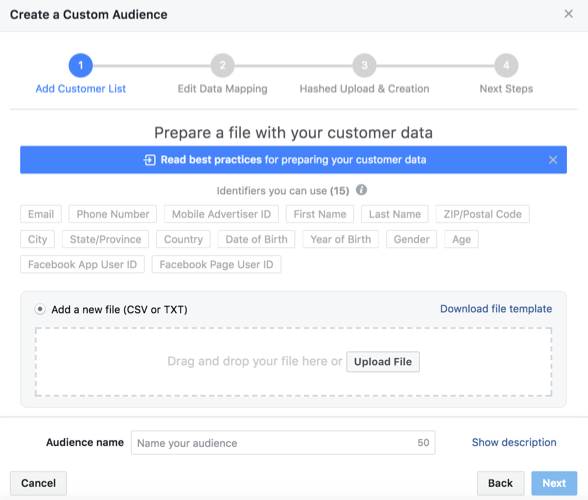 Just upload your file, follow the instructions and you’ll be able to create a new custom audience for your remarketing ads. 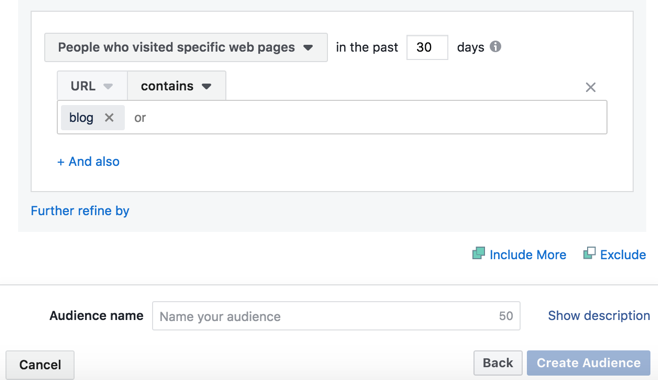 Another option available is to target previous blog readers based on your Facebook Pixel. 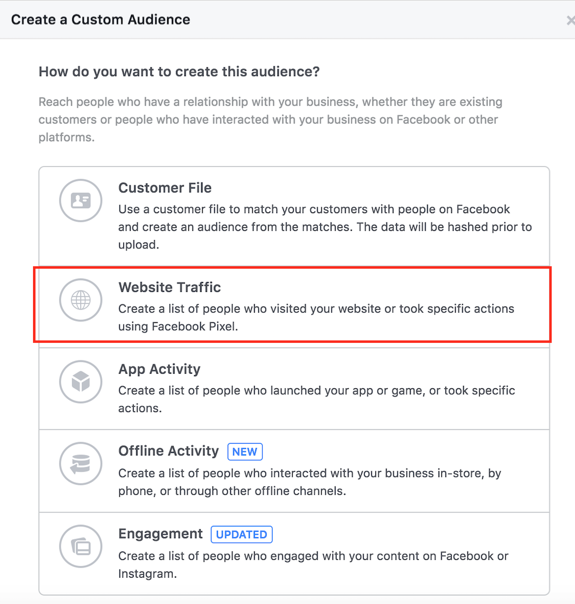 To do this, just go back to the Audiences tab, but this time select the second option: Website Traffic. On the next screen, select “People who visited specific web pages” to only target people who have visited your blog. Then, to “URL contains” add “blog.” This will work if you use the word “blog” for all your article URLs. If you’d like to target specific blogs, add the content there. 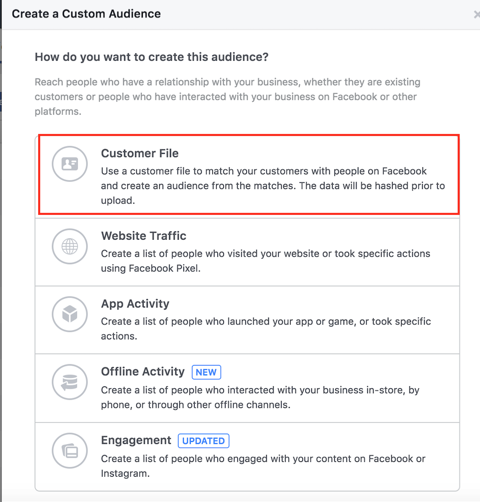 Once your custom audience is populated by Facebook, you’ll be able to use it in your campaigns. At this point, you have a strategy set up for email capture and retargeting; now it’s time to nurture your leads. You can do this with an email drip campaign. Don’t get scared by that term. They are just email campaigns set up with automated rules, optimized for conversions. For instance, you can set up an email drip campaign for anyone who signs up for your newsletters so they automatically get a welcome email. According to the recipient’s behavior (opens it vs. doesn’t open it), you will then set up another email accordingly. So, if a user opens it, you can send another piece of content to keep nurturing that lead, and so on. Email drip campaigns increase conversions because they are automatic (you don’t have to follow up manually) which reduces human error — and they are sent in a timely manner. The users will get the emails you’ve set up as soon as they fulfill any rules in the drip campaign. Armed with these tips, it’s time to start turning those blog visitors into lifelong customers of your brand. What other tricks or tactics have you used in the past that have worked in this instance? I’d love to discuss new ideas in the comments below.